One way to get fresher and more nutritious produce is to shop locally. Not your local grocery store :), but local farms, co-ops and farmers markets if available in your area. Here in Arizona we're in the midst of citrus season (among other crops) and it's easy to find plentiful oranges, grapefruits, tangerines and lemons. We recently had the opportunity to visit a friend near Phoenix that grows all the above and it was a memorable visit. 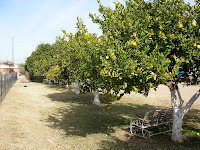 Our friend informed us that he fertilizes the trees with an organic compost every season and waters regularly. We tasted most of the fruit and noticed how dramatically different it was from even the organic produce at our local co-op. Fresh off the tree taste can't be duplicated.. just delicious! We went home with bags full of fresh fruits and have enjoyed them for weeks. 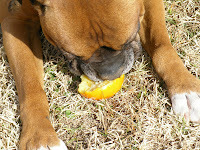 Our friend's dogs are also vegetarian... they eat all the fruits off the trees and any other vegetable growing in the garden. 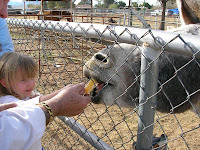 The neighboring mule 'Burrito' also enjoys the grapefruits and oranges. It's amazing how animals thrive eating what nature has to offer instead of man-made 'byproducts' and other animal products that give them 'man-made' diseases just like humans get. Coincidence? Enjoying the tastes of local produce, I also found a nearby farm that is currently growing a mixture of green vegetables, including green onions, mixed greens, brocolli and assorted green lettuce. The tastes are equally fresher and it's a pleasure to support local farms in growing sustainable, organic and fresh fruits and vegetables. With the massive proliferation of factory farming, it's more important now than ever before to support your local farmers and keep them growing!